Like Savvy, Scumble is memorable for its homegrown sense of fantasy and its fun and unexpected use of language. It’s more of a companion than a sequel, taking place a few years after Savvy and following characters from the same extended family (there’s a family tree so you can keep everyone straight), but fans of Savvy will definitely want to pick this up. The issues are similar – dealing with the startling ways that savvys (a magical type of ability that can be useful, destructive, or a combination) manifest themselves. Family is also important in the stories, and here we get a fun glimpse at more of this wacky group of people. When I describe the fantasy as ‘homegrown,’ I mean that it feels very American in the way it doesn’t derive from a mythology or use more conventional types of magic. Savvys often seem to be abilities particularly suited to the wide open spaces of the American west, where unnatural storms and earthquakes and the like are less likely to be noticed. There are no wizards or spells or forces of evil to be conquered – what’s more important here is learning to use your own innate skills and talents to the best of your ability. The fact that those skills happen to be highly unusual is just the icing on the cake. Perfect for anyone who enjoys a good combination of humor and fantasy, probably 4th grade and up, although something tells me that middle school readers might find more to identify with. Another recipe to make you yearn for summer – Scalloped Tomatoes from Smitten Kitchen. Which leads me to a confession – I much, much, much prefer cooked tomatoes to raw tomatoes. Sure, I like a nice caprese salad, but the star there for me is the mozzarella. I like a slice of tomato on a sandwich, or the occasional bite of a really perfect tomato in a salad. But I could quite happily never eat another raw tomato, as long as I still got them cooked. Sauce, soup, pizza – bring it on. And now, scalloped tomatoes. I neglected to take pictures – it’s not very photogenic – but Bronwen has some up. Unlike a lot of cooked tomato recipes, this one manages to still feel pretty summery. It has a nice amount of basil to complement the tomato, and the bread and cheese round things out nicely, making this substantial enough for a hot day, or good as a side dish. The leftovers hold pretty well, and you could even eat them for breakfast with an egg. Okay, now I wish it was tomato season again. Long Distance Kitchen is great for many things. It’s a good way to force myself to get around to making things that I like the sound of, but might put off otherwise. It also forces me outside of my cooking comfort zone when Bronwen picks things I wouldn’t otherwise try, expanding my tastes and skills. And sometimes it introduces me to recipes that I just end up loving, regardless of who chose it. Butter Chicken falls into the last category. It also fits into that fabulous category of foods that are delicious, relatively simple but still exciting, and have a fairly universal appeal. The kind of thing you can serve to dinner guests when you want a sure hit that you don’t have to stress over. Which makes it sound like I entertain all the time – I don’t. But I want to, and this recipe is definitely going in my mental dinner party file. First, you get the chicken marinating in spices, garlic, and lime juice. This involves a little prep the day before (or a few hours before dinner) for the full flavor effect, but I’m sure you could do a shorter marinating time and just end up with a slightly less flavorful result. When you’re ready to start cooking, you cook onions in butter, then add the chicken and let it cook a while on each side. Then you add tomato sauce and diced tomato, and let the whole thing cook for a while before adding the cream. 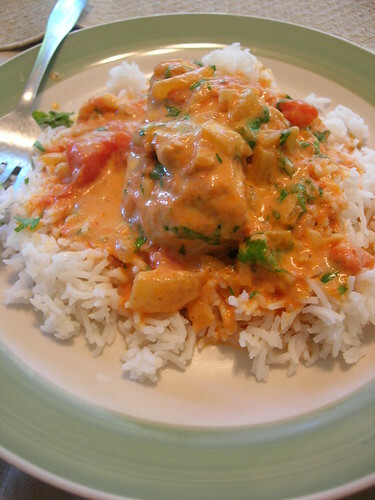 I’m sure there’s a reason this is called Butter Chicken, but it’s really Creamy Tomato Chicken in my mind, with a mild kick of Indian spices. Add some cilantro at the end if you want, scoop it over some rice, and dig in. Just don’t be surprised if you find yourself standing over the leftover sauce with a spoon in your hand. 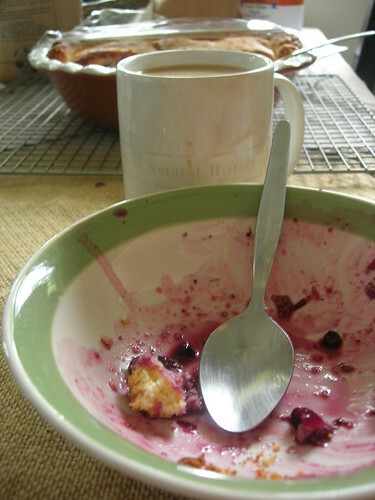 As Bronwen mentioned, of course it’s delicious – it’s full of cream! The recipe is also here, without all the photos. PW appears to use whole chicken breasts, while the original recipe in this link has you cut it up bite size. I think I made it once each way, and I think the bite size version is easier to serve up and might give you more of a marinade coating on each piece. The lists that I posted on Friday were for the mock awards that I’m actually attending in the Portland area. But why limit yourself to those? Lots of libraries put out mock lists and hold workshops for both kids and adults. My favorite to follow online is Heavy Medal at SLJ. They do host an in-person Mock Newbery in Oakland, with their own list of eight titles, but the online discussion is also very…robust. There are plenty of people with strong feelings about the books, and Nina and Jonathan do a great job of keeping the discussion relevant to the criteria. The discussion certainly isn’t limited to their shortlist, which is also great – it gets me limbered up to discuss the books on the OLA/WLA list, and it gets me thinking more broadly about the criteria. Are there any others I should be following? Or any good Mock Caldecott and Mock Printz discussions? Even though I wasn’t completely on board with A Curse Dark as Gold, I always had a feeling that I just hadn’t given it my full attention and appreciation. So I was looking forward to seeing what Bunce would write next – and I wasn’t disappointed. The only disappointment might be that the book doesn’t tell you it will have a sequel until you reach the end – but even that I can live with, because enough things are wrapped up and enough are left hanging. In terms of mood and pacing, it reminds me of Graceling – some political intrigue, a setting that feels both historical with some fantasy thrown in, some fighting and adventure and deceit. Although I must note that Bunce mixes in only the merest hint of romance, while Cashore throws in a good deal more. The developments in the plot kept me guessing throughout, but there were no twists so unlikely that they took me out of the story. With so many different appeals, I could see handing it to a variety of readers – fans of historical fiction, fantasy, spy stories. Readers who like good world-building, character development, or snow-bound stories where characters try to keep their secrets in close quarters. The cover might be a touch girly, but I can see this appealing to boys, too. Recommended to sophisticated middle school readers and up. I’m not quite sure how the last two weeks slipped by without a post, but it’s sure not for lack of things to write about. I spent a few days in California visiting Bronwen and Kate, and came back with lots of pictures of Linnea and some of the grown-ups in the kitchen, which is where we quite happily spent a lot of our time. (I still need to go through the pictures and upload the best of the bunch.) Bronwen and I caught up on some Long Distance Kitchen recipes that we’d both neglected and we shopped for unusual grains, and at Kate’s we were treated to tuna that Keith caught, fresh chanterelles and enormous oysters, and of course some extremely local bacon (as in, from their pigs). The Dreamer by Pam Munoz Ryan. Illustrated by Peter Sis. Scholastic, 2010. The Mysterious Howling by Maryrose Wood. Illustrated by Jon Klassen. Balzer & Bray, 2010. The Night Fairy by Laura Amy Schlitz. Illustrated by Angela Barrett. Candlewick, 2010. One Crazy Summer by Rita Williams-Garcia. HarperCollins, 2010. They Called Themselves the KKK: The Birth of an American Terrorist Group by Susan Campbell Bartoletti. Houghton Mifflin, 2010. Woods Runner by Gary Paulsen. Wendy Lamb, 2010. I’ve read them all except They Called Themselves the KKK (which is also on the Mock Printz list), but so far I’ve only written about the ones I linked above. My favorite so far is still One Crazy Summer (and I recently finished listening to the audio version and thought it was even better on rereading). I’m also partial to The Night Fairy and I’d vote for The Dreamer, too. They Called Themselves The K.K.K. : The Birth Of An American Terrorist Group. Bartoletti, Susan Campbell. The Last Summer Of The Death Warriors. Stork, Francisco X.
I still need to read Nothing, Revolver, As Easy as Falling off the Face of the Earth, Spies of Mississisppi, and They Called Themselves the KKK. In an ideal world, I would also reread A Conspiracy of Kings and Finnikin of the Rock, although not back-to-back like I did initially (Finnikin suffered). While it would take a miracle for anything to supplant COK in my affections, I do owe Finnikin a fair shot. I also just got Incarceron on audio – I don’t know if I’ll listen to the whole thing, but I wanted to have it a little fresher in my mind before the discussion and before Sapphique comes out at the end of December. In a flash of brilliance, I just put the audio version of Finnikin on hold, and hopefully I can squeeze that in. I’m sure I’m forgetting one, but my mind is blank. Right now my favorite is City Dog, Country Frog – not only because I just plain love it, but also because I it’s most effective at being a picture book. I mean, I can pore over the illustrations in Mama Miti or admire the genius of Art & Max, but neither of these has that seemingly effortless combination of pictures, text and story. The award is for “the most distinguished American picture book” and to me, this one fits the bill. Some of the others might have more extraordinary illustrations, but this is a picture book that really has “a collective unity of story-line, theme, or concept, developed through the series of pictures of which the book is comprised.” And yes, I don’t think it’s in the criteria but I’ll admit a preference for books that make good read-alouds. While this isn’t strictly speaking science fiction, it does involve children going into space, so let’s slap on that label and call it good. Cosmic takes an unlikely premise and runs with it, really making it work both in terms of character development and solid humor. It plays off our ideas of what it means to be a child or an adult and what we expect of each. Just because Liam is tall for his age (and already needs to shave), people expect more of a “big lad like you.” And when he takes advantage of that in child-like ways (trying to test drive a car, not correcting people who assume he’s a teacher, not a student), the adults around him are extra disappointed, having assumed that maturity went along with his size. Things really heat up when Liam finds himself pretending to be a dad in order to win a chance to go on the world’s largest thrill ride. There are two surprises – what that thrill ride really is, and how much Liam actually learns about being a dad. Part of what he learns stems from the expectations put on him, but part of it is also that he knows what it’s like to be a kid more than the real dads in the group. This makes it sound like it’s all thoughtful character development, but that stuff gets tucked in between Vomit Comets, comparisons between the real world and World of Warcraft, and quotes from the parenting guide Liam borrowed from his dad. It’s the kind of thing where every other page begs to be read aloud. I managed to talk my age 10 & up bookgroup into reading this for November – the kid I thought would love it gave it an okay rating, one girl gave it an 8 out of 10, and another hadn’t read it. But we did have a great discussion about kids going into space, what we would do on the moon, and what they would do if they could pass for adults. Liam is always describing things he loves as “cosmic,” and the book definitely deserves that title. I love pancakes. So of course, when I saw the recipe for multigrain Buttermilk Pancakes in Good to the Grain, I had to assign them for Long Distance Kitchen. Yeah, yeah, I’d already assigned buttermilk pancakes back at the beginning of the project, but this recipe calls for a combination of whole wheat flour and a multigrain flour mix, so I knew the end result would be much heartier, and I wanted to see how it compared to my golden pancake standard (the Martha Stewart recipe I assigned the first time). The multigrain flour mix proportions are included in the cookbook, so I bought yet another flour canister and mixed up a batch – which has so far lasted me through two or three batches of pancakes and a batch of waffles. Just whisk together 1 cup each of whole wheat flour, oat flour, and barley flour, with a half cup each of millet flour and rye flour. This of course necessitated a trip to Bob’s Red Mill for bulk flour (estimating quantities was the hardest part, since I didn’t want to have too much leftover). 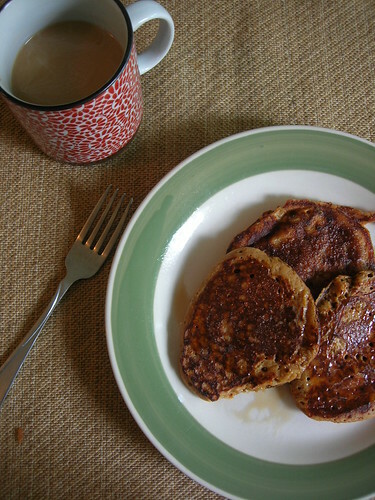 Then you mix up your pancake batter, being sure not to overmix so they’re nice and fluffy, and cook them up. Easy-peasy. I’ll often make half-batches of pancakes, unless I have a bunch of people over for brunch, or I’ll keep the leftover batter in a Pyrex bowl in the fridge to cook up later. Not quite as fluffy as the first time around, but still tasty and even faster. These were definitely heartier than Martha’s recipe, more substantial and less decadent, while still being completely satisfying as a buttermilk pancake. Delicious with butter and syrup, or fresh fruit, or yogurt, or whatever you like. I noticed they stuck with me a little longer than white flour pancakes, and they aren’t any harder to make once you’ve got the multigrain mix going. A keeper. While I suppose this story could stand on its own, why not have more fun and listen to the whole series? Start with Bloody Jack (on audio – don’t miss out on all the fun) and continue from there. Under the Jolly Roger is the third in the series, and of course Jacky finds herself having further adventures and misadventures. For readers who were disappointed that the second book took place on land, don’t worry – she’s back at sea. Of course the plot is over the top and Jacky finds herself in any unlikely situation imaginable, but the story is good fun, the characters entertaining, and the narration by Katherine Kellgren is impeccable. Recommended for fans of swashbuckling adventure and tough heroines. Another summery recipe to torment you – except with this one, you can just as easily use frozen fruit as you can fresh, so there is no need to cry. 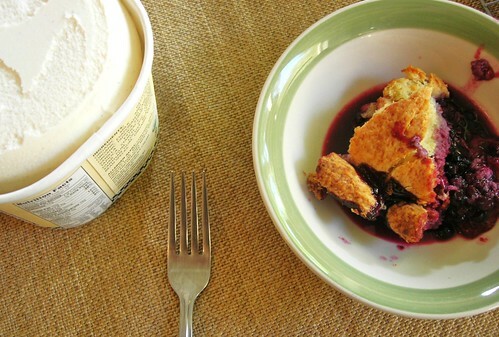 Whip out those frozen berries and make your own cobbler – warm cobbler sounds fantastic for a blustery fall day or for a hot summer day. The recipe is from Dorie Greenspan’s Baking (a cookbook I can thank Kate for introducing me to and sending to me). Follow this link for the recipe on NPR’s website. The recipe calls for about 5 cups of mixed berries, and when Bronwen mentioned she was thinking of uses peaches or a berry-peach mix, I jumped on board with that idea. It being July, I had fresh peaches on hand and I wanted to use up the frozen berries I had in preparation for moving in August. So I think I ended up with two peaches, a tiny bit of frozen marionberries from my parents’ yard, and the rest frozen blueberries. 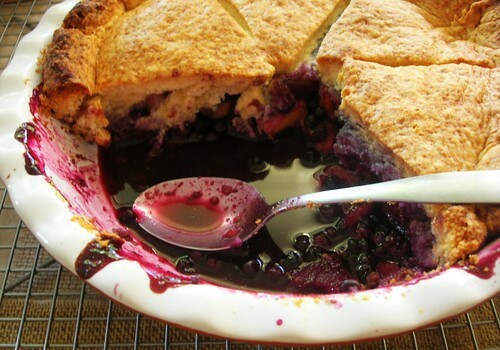 Here’s where I have to confess that I’ve never made a cobbler I loved until this one. Sure, they were tasty fresh from the oven, but within minutes the biscuity layer would go all soggy and sink into the juicy berries, and any leftovers would be a mushy mess. 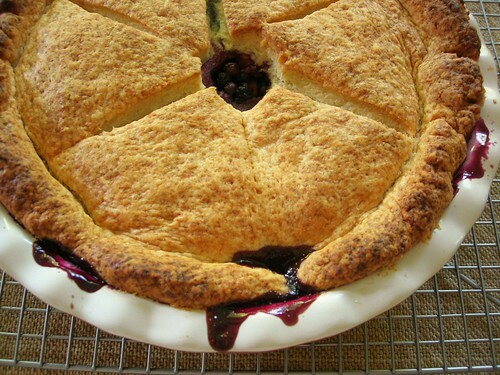 As you can see, with this recipe the dough is one solid but thick layer – you roll it out like a very thick pie crust, without worrying about neat edges, then you lay it over the filling to bake. This way it stays suspended, and the top is still crisp the next day, even though the underside soaked up a lot of the juices. Perfect. See?